In middle school, I used to draw letters. I'd never heard of lettering. I didn't know there was such a thing as "typography" or that there was a name for fascination with letters. I thought I was weird. As I grew older, I stopped drawing letters. It was just a silly hobby, I thought, and I had work to do and bills to pay. I then met a friend for coffee. He was an "online friend" and this was the first time we were meeting in person. He was a hand lettering artist and I was inspired by his work. "If you love it, just do it! It doesn't have to be a job." This was the first time anyone had said something like that to me. I always assumed that if I was going to spend time on something, it somehow needed to be financially viable. I knew hand lettering would never be a thing that would make me money. It wasn't until this friend gave me permission that I decided to pursue my lost side passion. In my nights and weekends, I drew letters. For years, I spent 6 to 8 hours a day, outside my job, drawing letters. You may have heard my story. It didn't happen overnight, but within a few short years, not only DID lettering become my full-time pursuit, but I made well over half a million dollars doing it. I know you're passionate about something—maybe even multiple things. You have hobbies and projects on the side you tinker with and poke at every once in awhile. "Those things could never become my main pursuit." You may feel like it's too far fetched. It's not "realistic". It's too obscure. I thought the same thing. I couldn't have dreamt I would ever reach a point where I could do what I loved and make a living from it. Now, it wasn't easy. It took time and hard work. But it was fulfilling work. Doesn't it feel like that part is missing from what you're doing? What if you could do it? What if you could make it a reality? What if it is possible to turn your side passion into a successful business? Not only did I live it, but I've helped many others do the same. In fact, the process of helping people get out of a soul-sucking day job and create the life they want is so fulfilling, I've dedicated myself wholly to it. Even more than making great money for myself doing work I enjoyed, I found fulfillment in helping others get unstuck. For the past several years, I've committed myself to codifying the process of overlapping from the day job you're in now to where you want to be. I've recorded hundreds of podcast episodes, hundreds of videos, and given dozens of talks about the subject. 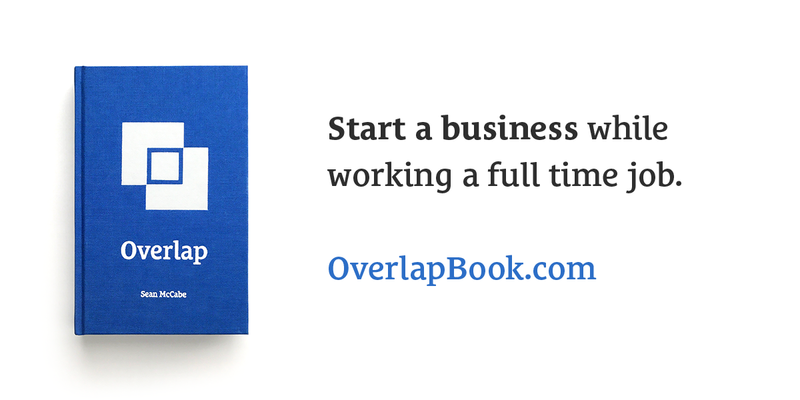 In the past year, I've worked to condense everything in ALL of my material into a single, concise resource called Overlap. If you've heard all 322 episodes of the seanwes podcast, there's even MORE inside this book. New insights, gems, context, and never-before-told stories. If you haven't heard all 322 episodes of the seanwes podcast, you're in luck: you don't have to. Overlap condenses years into hours. It's like downloading blueprints into your mind—whether you prefer to swipe, listen, or turn physical pages, I've created a format of this book to suit all consumption preferences. This is truly the greatest work of my life to date, and I guarantee it will change your life. This is more than a book. Overlap is a movement. Overlap gives words to complex concepts that have previously been difficult to discuss. You will now have words to hold a discussion with those in your life you care about most. You will finally be able to explain what you want to do without sounding crazy. They will finally understand. You'll be able to help them, and help them help you. Your side passion is more than a distraction from your day job. You feel a yearning because it is your purpose—or at the very least, it is what will lead you to your purpose. Overlap does away with all the cliches. If "follow your passion" quotes on social media are junk food, Overlap is the meat. You'll find nothing but practical, down-to-earth steps that will guide you to clarity and unlock those "aha!" moments. I want to send you the book before anyone else. The book launches on September 14th. I hope you check it out!